Adopted father and son team put up the warmboard in ceiling. Billboard building wrap over module A and B.
Demilec Insulation blown into mechanical room wall. Looks like Angel Food cake! Don't eat it though. 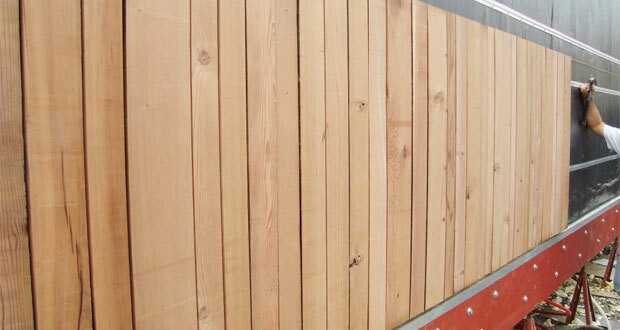 Salvaged redwood slats make up our siding. Thermablok insulation over moment frame of Module B. Made from disposable straws, this 'Straw Pendant' hangs in the middle of our living room. The straw-fixture at night. We call it the snowball informally because it's so pretty. The metal of this fixture softens and beautifies the strong LED light. Our lighting design maximizes the admittance of high quality sunlight through windows, increases the spaciousness of the house by bringing the outdoors in, and minimize our electric load through strategic use of daylight. The Refract House uses materials that have a sustainable life-cycle yet have the highest performance qualities. The materials support the house's mission to blend aesthetics with performance. We have taken advantage of the southerly orientation of the house and the amount of daylight that it provides. Our use of glazing on the end caps, glass doors, and clerestory along the northern and eastern walls allows in enough sunlight to nearly eliminate the need for electrical lighting during the day. We have opted for LED lighting in nearly all of our fixtures. 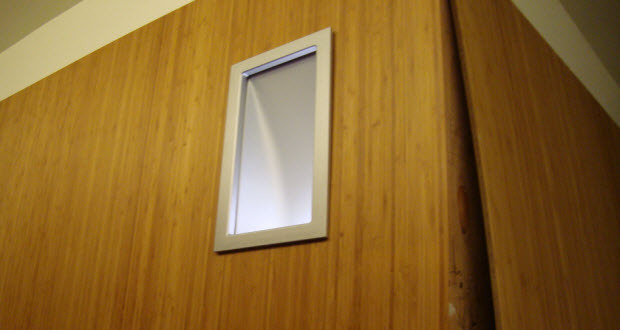 Their low energy consumption and extremely long life makes them an attractive, energy-saving component of the house. Additionally, their mercury-free construction as compared to fluorescent lights, and the issue of proper disposal of CFLs has guided our choices. Ultimately, we believe that LED technology is the healthier, sustainable future of electric lighting and thus a definitive element of the Refract House. For accent lighting outdoors, we will use self-contained solar-powered lights by Meteor. These lights use the latest in solar cell, LED lighting, and ultracapacitor technology, which means lower energy consumption, safer walking spaces, and minimal maintenance for residents. Due to competition rules, we will use a conventional battery version that requires replacement every 3-4 years, though the ultracapacitor units last as long as 10 years. All of the wired lights are incorporated into the controls and monitoring system of the house. The system allows for both individual fixture adjustments as well as house-wide or area-specific lighting. Lights will be controlled through LED panels and two-way switches located in each of the three modules. Residents have the option of remotely changing the lighting through an iPhone application specifically developed to control and monitor the systems of the Refract House. This makes the Refract House a “smart house” but it also makes the residents smart consumers; having the ability to easily access and modify the lighting will ultimately help reduce energy consumption due to lighting throughout the year. The use of steel in the house was essential structurally, however it did pose a challenge thermally. Because steel is so thermally conductive, when it is placed close to a thermally active surface, say, for example, our radiant subfloor or ceiling, it will more easily draw that energy through it. Plus when our steel moment frames are in direct contact to the outside, it essentially opens up a path for the energy in our home to escape to the world. This process is known as thermal bridging. To prevent this thermal bridging, essentially ensuring that all the energy we put inside of our home, stays in the home, we placed layers of ThermaBlok aerogel (which has a low thermal conductivity) between our thermally active surfaces and steel moment frames. In fact, to prevent thermal bridging throughout the house, not just where it was particularly bad, we added a layer of ThermaBlok to all studs, essentially adding an additional layer of insulation to our house. We used two types of insulation in the house: Demilec Agribalance and recycled denim. The Demilec Agribalance is a vegetable oil based sprayed foam insulation. It looks like angel food cake and has great insulation properties. If it was needed that we had to get to something that had been insulated, it could be ripped out by hand. Then we replaced with the denim. Used like standard insulation, the recycled denim is just as easy to use as conventional Batt insulation. Whenever we ripped some of the Demilec out, we'd just replace it with some of the denim. To keep a home like ours properly conditioned, we have to make sure it was well insulated at every point. The Radiant Heating and Cooling in the house is done by hot or chilled fluid that moves through the ceiling and floor of the home. 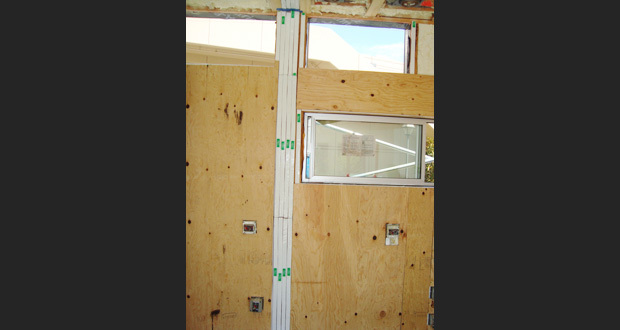 These pipes are routed in Warmboard, a subfloor that is designed for homes using radiant conditioning. The advantage of this is that there isn't an extra component that has to installed for the radiant systems, it is both the housing of tubing and a subfloor. The elm flooring used in the home is reclaimed from trees that died of Dutch Elm disease. It is the same material as the surface of the central courtyard. This is to reinforce the concept that the courtyard is continuous with the interior of the home. 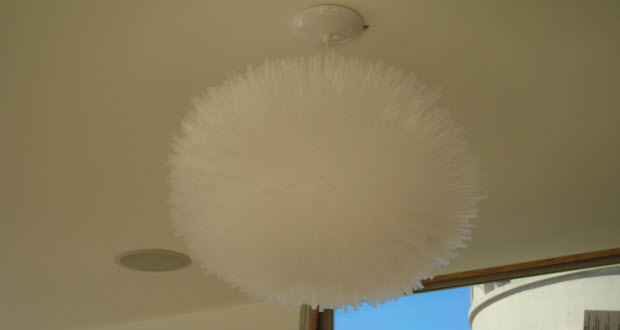 The beautiful straw fixture that meets you upon entry in the home is actually called the Straw Pendant. It was donated by a Bay Area artist known as Dave Meeker, and was chosen because of its creative use of what we consider 'disposable' items.